Adrian started a special preschool program when he was first diagnosed at 2.5 years of age. I’d made the decision to be a full time mom so there was no question that I’d be driving Adrian to and from his preschool each day. The girls were about 6 months old and handled the 30 minute ride well. I’d run errands after morning drop off, head home and then leave the house a bit early in the afternoon so the girls could get a full nap in the car around pick up time. When we moved, the ride to his new school was still about the same 30 minutes so we kept our routine. Then he moved to his kindergarten classroom at 5 years old. The girls had just turned 4 so when busing was offered I figured we’d give it a go. The worst case scenario if it didn’t work out was that we’d all have to go back to our familiar routine. From the start there were serious problems. Within those first few weeks the bus folks were reporting tantrums, hitting and kicking windows, hitting and kicking and pinching other people on the bus, taking his shoes off and sometimes even throwing them at the driver. I met with the bus driver, aide and bus company management and tried to give suggestions. They tried playing his music for him, tried taking his shoes off as he entered the bus (which was really just a minivan), tried having the aide sit in various places and interact in various ways. Things would get better for a bit but there was no way to make everything go smoothly all the time. After several months of trying I did eventually go back to driving Adrian myself. We’d give bus rides another go many years later with equally mixed results. The ride to school was impossible but the ride home from school could be managed… most of the time. There’d still be occasions when I’d get a phone call and have to run to the school to pick him up myself. Adrian’s difficulty on the bus was one of the points we made to the school district to support his going to a residential school. They were pushing for him to ride an hour on a bus to and an hour home from the school every day instead. Yeah, right! Reading back through the notebook we used to communicate with Adrian’s teacher and therapists from his kindergarten year I found a familiar problem discussed. Pinching. This had been a problematic behavior for Adrian as far back as I can remember. It probably started when he was a toddler, when most kids move into verbal communication methods. Without being able to speak, he relied on non-verbal methods to express himself. Pinching was one of these. The new kindergarten teacher asked me if there was anything specific we did to deal with his pinching. I explained to her that in the past we’d tried time-outs and other discipline measures without success. Reminding him to ‘touch nice’ seemed to work when he was using it as a means of getting your attention but not when he seemed to do it out a sensory or compulsory need. For many years I had black and blue marks up and down my arms. Adrian’s been known to pinch complete strangers in crowded places. I was constantly on alert to protect myself and others from his fingers. Today Adrian still pinches himself and others. But, in general, I think he pinches less now than he did in years past. Part of that is due to being with people that ‘get’ him and are able to respond well to his needs and wants. Part is probably just maturity and more reliance on other communication methods. Part might be the medications he takes now too. While I wish I had some clever solution to offer to parents who are going through the worst of it now, I don’t. Best I can do is give hope that it can get better. It did for us. Already we’re nearing the end of October and it’s time to schedule visits with Adrian for the holidays. This will be Adrian’s 3rd Thanksgiving and Christmas living at his residential school. The past two years we’ve had Adrian home for both these holidays. Christmas seems to work out ok. Thanksgiving? Not so much. I guess a lot of that has to do with the different schedules of these two holidays. Christmas we always have a big breakfast, clean up and then settle in to open our gifts one by one. It’s a process that takes a while but Adrian is usually happy to play on the X-box or computer during that time. He occasionally drops by to see what’s up and we give him a gift or two to open himself. Then he’s back to his games. We always make sure he has a new game or movie to open early and the novelty of those keep him occupied. Contrast that with Thanksgiving. The main meal is served late in the day. Unlike the Christmas morning feast, not everything can be make-ahead-and-bake. Even though my husband handles the turkey and gravy, all the side dishes are mine to prepare. And it never fails that Adrian is bored and starting to flip out the exact time that I need to finish my part to get dinner on the table. Last year I anticipated it and prepared almost everything ahead of time… and it was still rough. Just as everyone is ready to set down to eat, Adrian and I are walking out the door for a ride to calm him down. No one wants to eat without me so it throws everything off. We eat and around the time dessert is ready to be served I have to take him up and put him in the shower to calm down again. He doesn’t understand why we can’t go to the mall like we always do on his home visits. He doesn’t like that all the visitors are taking my attention when he wants it. He’s bored with all the entertainment choices by the afternoon. And to make it worse, he really isn’t even into the turkey dinner we’re all trying to enjoy! So I’ve make the difficult decision to not bring Adrian home for Thanksgiving this year. I call it a ‘difficult’ decision even though reading through the paragraphs above it seems like the obvious thing to do. Adrian is my boy and he’s always been with us for Thanksgiving. It isn’t an easy thing to intentionally change that …even if it is the better choice for us both. Instead of bringing him home for Thanksgiving this year I’m making plans to take him the weekend afterward. We’ll go walk his favorite malls and eat his favorite meals – just the two of us. Just the way he likes it. And I’ll have a very peaceful, but slightly lonely, Thanksgiving this year. When I heard that Disney was changing their policy for those with disabilities a while back I was very concerned. Like so many others, we went to Disney World year after year because the policy made vacationing with our autistic son possible. Before this trip, I did extensive reading online about how this new policy worked and about the experiences of those who had already used it. The reviews were mixed. There are many different types of disabilities and challenges so I suppose that should be expected. It worked for some and didn’t work for others. In general, it did work for us. When you go to the customer service desk at any one of the parks, they issue you a Disability Access Service card. This DAS card is good for the length of your stay. The valid dates, number in your party as well as the name and a photo of the person with the disability is digitally printed on the front of the card. You can’t use the card to board a ride unless the person on the card is with you. This is a change from the old system and I can see why some might be upset about the change. This trip we were only traveling with Adrian so it didn’t affect us. However, in years past we did use the disability card to allow the other kids to ride rides that Adrian didn’t want to go on. Perhaps some would call that ‘cheating’ the system but you have to remember that Adrian’s disability meant that we could only stay in the parks for a short time before he needed a break. It was beat the clock each and every time we entered a park. If the other kids had any hope at all of riding on things without Adrian, we had to use the pass to get them in and out quickly. Adrian could not wait. Leaving only one parent with him, wandering in circles for as long as the standby line took would have ended in disaster. The thing you have to remember about the new DAS card is that it’s designed to be used in conjunction with the FassPass+ system. If you are not using the FP+ system then it’s likely you will find the DAS card policy severely limiting. If we were to travel with the whole family today we’d have to rely on the FP+ system to get them in and out of rides Adrian doesn’t like. It would require a bit more planning and be a little less convenient… but I don’t see it as a complete deal breaker and I won’t say that it’s not ‘fair’. Another big change in the policy is that the DAS card does not provide immediate access. Under the old disability policy you simply showed the card at the ride and were directed to the ‘disability entrance’. In some cases this was a separate, wheel-chair friendly entrance but for some rides it was the FassPass line. It was this part of the old policy that lead to abuse by unscrupulous people and the need to switch to the DAS card system. Again, I understand how some people are upset by the new system. It is less convenient. With the DAS card you have to take it to the ride entrance to get it stamped and they write a return time on the card. In other words, you wait as long as the folks on the stand-by line… you just wait some where else. Actually, that’s not true. You sometimes wait longer because when you do return you still have to wait on the FP+ line. This trip, Adrian was able to handle going up to a ride and then coming back later. When he was younger, he couldn’t have handled it. One of us would have had to go get the stamp while the other took Adrian in a different direction. You can only have one active stamp at a time so I understand why some people may be particularly upset about this part of the policy. While it would be extra work, I still don’t think that even back in the day it would have made it impossible for us to visit. And I wouldn’t say it’s not ‘fair’. The last major change with this policy is that when you return at the time written on your card, in almost every case, you will enter the FP+ line. Disney has done a great job making most of the queues accessible. There are very few rides left that require a separate wheelchair entrance. The down side here is that the FP+ line is a line. With everyone using the FP+ system now, it’s not a ‘walk on’ line any more. Though minimal, there is some waiting. It’s probably this part, more than any other, that I think would have tripped us up back in the day. Of course, we didn’t have iPods, iPads or phones all connected to the internet back then either. We didn’t find the waiting that hard this time because we had the wheelchair and we did use an iPod to keep him entertained while we waited. With this policy, I will never take Adrian without using a wheelchair. Even today he could not handle waiting like that without the wheelchair and something to entertain him. All things considered, I think the new policy is well thought out and should work to accommodate most people. One of the things I love about Disney is that, almost without exception, the employees are very accommodating. It happened more than once that they bent the rules a bit. Some wrote down a slightly reduced wait time on our card. Others let us enter the FP+ line a few minutes ahead of the scheduled time. I’m aware of additional accommodations some people have received as well. A woman who had an autistic child went out of her way to tell me that I should go to customer service and demand generic, paper fastpasses. We didn’t find this necessary this trip. But I can see that as something some folks may need. I’ve also read online that if your child has a compulsive need to ride a ride multiple times in a row, that they will often allow that. I still think Disney World is a great place to go if you have a family member with autism but there is some preparation and work involved to make things go smoothly. My advice is to go at the least busy time of year, use the FP+ system in conjunction with the DAS card, bring enough help and electronic entertainment, consider using a wheelchair and if you have a specific need, it never hurts to ask a cast member or two for help. From that very first trip to Disney World with Adrian, we learned a very important lesson that not only changed our vacation strategy but also our life at home. Adrian could quickly become overstimulated (and then aggressive) in certain environments, especially Disney. But when he was seated and buckled into the stroller it worked like magic to help him be calmer and enjoy it all without being overwhelmed. When he outgrew the stroller we switched to the wheelchair and found it had the same positive effect. Ever since, we’ve owned a wheelchair for Adrian and we always use it traveling with him. Besides helping keep Adrian calm and patient, it makes it easy for others to recognize he has a disability. Autism is invisible except for the behaviors. Adrian looks just like any other 18 year old young man. The wheelchair immediately let’s others know he has a disability which makes them more likely to give us a break. No one is surprised when they see him act in strange ways. People around us are more accommodating, understanding and patient. Now I know some would say that he should walk if he can walk. But if the point of the vacation is for us all to relax and enjoy it, then it makes sense to do what we know works. The couple of times we did let Adrian walk around this time just confirmed for me that it is the right choice for us. Adrian has no sense of personal space and when he’s walking around he often plows through groups of people, bumping them as he goes. At nearly 6 feet tall and a hefty build, I’ve seen him nearly knock people down just passing them. His size makes it very hard for me to guide and steer him. I’m only just over 5 feet tall and no match for his momentum. In stimulating environments Adrian has a hard time hearing and following verbal directions. So you’ve basically got an out of control tank in a very crowded place. Besides the benefit to parental stress levels and everyone around us, Adrian just seems happier using the chair as well. You can see his body relax and his energy become calmer as soon as he clips that buckle in his chair. He takes it all in and enjoys the ride. He’s not overcome by a need to constantly stim like when he walks. Fortunately Disney World is very easy to navigate with a wheelchair. Most of the queues are wheelchair accessible and cast members are very helpful. Using the wheelchair for Adrian is one way we do Disney a little differently. We’re back from our trip and I am happy to report that it all went really, really well. A local snowstorm caused a bit of stress getting out of NY. We had to sit on the plane for nearly an hour while they sprayed the plane with deice gel twice and blew hot air at the ice in the engines. It was the only time the entire trip that we had to turn to the emergency meds. And I admit, I probably did so a little preemptively knowing there was another 30-45 minutes of sitting there on the plane going no where. No regrets. He waited it out patiently and we were soon underway. The rest of the trip was splendid. Adrian was calm and happy throughout. My husband and I were a bit surprised by how relaxing and enjoyable it was. In many ways it was much less stressful than traveling with 3 typical kids with all their typical sibling fights, typical complaints and typically different ideas about what we should do next. No. This trip was just for Adrian. So we went from park to park, ride to ride – only ever going on the things Adrian liked best. We used maps and apps to allow him choices about where he wanted to go and what he wanted to do or eat. But even when we were doing the planning, he went along happily and patiently. There was not one aggressive behavior incident. No pinching. No fits in the car. No fits in the restaurants. Just happy and calm. It was amazing! That’s not to say that he wasn’t Adrian. He did get silly once or twice. He took a whole box of Cheerios and ran the the bedroom and closed the door, laughing hysterically. But then without the stress of having to deal with other kids too, it really wasn’t a big deal. If he wanted to eat Cheerios in bed, why not let him? We opened the door and left him right there in bed watching tv with his snack. I think even he was shocked that we were so chill about it. Now that we’re back and I know how well these trips can go, I’m definitely looking forward to taking him again in the future. I’d love to make it annual but considering how much it costs… well it might be every other year instead. Still. So happy to have returned to say it was a super successful trip and we can’t wait to do it again! As I’m making final preparations for our upcoming Disney World trip with Adrian I’m thinking about how things will go. I want to be able to say the trip was ‘successful’. But then I need to define what success looks like. The last trip we took 5 years ago was difficult. We were with many family members and we were trying to be flexible and go along with what everyone wanted to do. Adrian was less flexible than we’d hoped. I came back black and blue up and down my arm. He pinched me hard enough to bring tears to my eyes more than once that trip. There were several outbursts in public. He even reached out and pinched a stranger – hard. He banged on the window of the rental car so hard we had to wonder if he’d break it. He broke parts of his wheelchair. He pinched himself and pulled out his own hair. When you put it all together like that it seems pretty ‘unsuccessful’. And it definitely felt that way at the time. So what needs to change this time to say it’s better? Do we need to have no public outbursts? Does he need to not pinch me? Does he need to not injure himself? Do we need to have 100% peaceful car rides? If the wheelchair returns in working condition, have we succeeded then? Is it still success if we get all that but have to use the ’emergency’ meds every day? I’ve gone out of my way to plan everything on this trip to maximize success. We’re taking Adrian alone and we’ll only do exactly what he wants, when he wants it – to the best of our ability. We’re staying in the place where he’s most comfortable and where we don’t have to worry about how he’s affecting other guests. We’re renting the car so we can have immediate transportation any time we need it. We’re going at a time when the crowds are the lowest… there just isn’t much more I can do to make this go as well as it can. But in a way that makes me all the more nervous. Because if this doesn’t work, if it’s not a successful trip, then I have to face the reality that it may be many years before we’ll be able to try again. And, quite honestly, that would simply break my heart. Still trying to define a ‘successful’ trip. We started Adrian on the GFCF diet this past week. This, of course, means a lot of restrictions on foods so I’ll be sending both snack and lunch foods from now on. It was not an easy decision to try Adrian on a special diet. First, there’s the skepticism to get by. As a young parent, it’s hard to go against convention. Especially when you’re not sure what’s the right thing to do. There were other potential ‘treatments’ we passed by because they were a bigger step than we were prepared to make at that point. The diet, on the other hand, seemed fairly harmless. It wasn’t going to hurt Adrian or the bank account to give it a try and see what happened. So we committed to a one month trial removing all gluten and casein from his diet. Back in those days that was not an easy feat. Today I walk in my grocery store and there’s shelves full of gluten free products. Back then, to find anything gluten free at all, you had to shop specialty health food stores and even there the selection wasn’t great. It was a lot of work to prepare the food. And for a kid who didn’t take easily to new foods well, there were other challenges besides. And that was all in the first month after starting the diet. It was a lot of improvement over a short period of time. He’d been in school a full year and we hadn’t seen that much so fast in all that time. Could it have just been coincidental? Yup. We’re talking about a kid who was getting full day preschool including multiple therapies who had 2 sisters at home who were themselves going through many of these same developmental milestones. Maybe he was just ready for all that and it would have happened diet or no. But as the diet wasn’t causing any great hardship on Adrian and we were seeing such good things… well, why not stay on it? In the following month we saw more great strides. Attempts to say more words – out, all done, eat, etc. Again, this is all within 2 months of starting the diet. Much, much more progress than we’d ever seen before in such a short time. It was encouraging and not knowing if it was the diet or something else, we decided to just continue it indefinitely. I’ve started to really require eye contact. If I have something to say to him I wait for eye contact. He’s doing well and most often ‘answers’ me the first time I say his name. He also has been maintaining it until I finish speaking. I finally feel like I’m talking to him instead of at him. Adrian’s eye contact as a baby wasn’t horrible. One of my favorite pictures of baby Adrian is one where I’m playing pat-a-cake with him. He loved that and peek-a-boo and would hold eye contact with me forever while I played with him. Today Adrian has good eye contact. He seeks it out. He wants to know you’re listening when he’s trying to tell you something. He’s learned to read people’s faces extremely well and he looks to see what you’re saying or how you’re feeling. I recently cleaned out the file cabinets and pulled out the collection of notebooks used to communicate with Adrian’s classrooms through the years. I can’t really think of a good reason to keep them around at this point. It’s not terribly practical or helpful to know what the problem du jour was back in 1999. 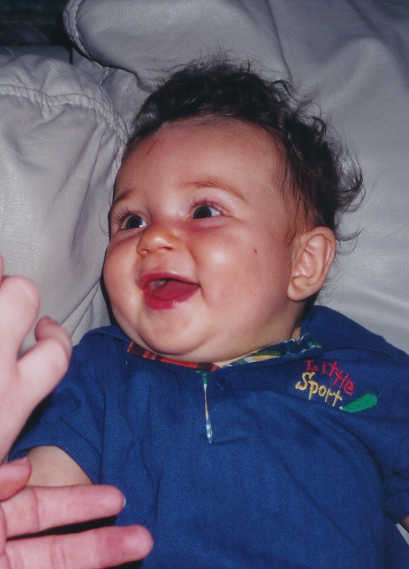 Adrian was diagnosed with autism in the spring of 1999 when he was just over 2 years old. He immediately started attending a special ed preschool where he received speech and occupational therapies. My twin daughters at the time were 6 months old. Yes, I really had my hands full! The first thing I saw in the notebook from that first year was the fact that they used PECS with Adrian from that first day. I sent in pictures for chicken nuggets, yogurt and family members. He picked up the use of them quickly. Being reminded of how successful he was with these even back then makes me feel more than ever that PECS really are a old and babyish method to be using with a grown man. Thankfully, in recent years most of the staff working with him have moved away from using them. Bee has picked up Adrian’s humming while eating habit. Ahhhh! How do we stop this insanity? LOL Oh, to be able to laugh about these things today! Bee saw her older brother loudly humming while he ate and thought it was the way eating was done. If I recall, we had to constantly interrupt her copycat behavior until she finally stopped. Simply exhausting for us and very confusing for her! And duct tape on the diaper! I’d completely forgotten about that one. How many parents keep duct tape in the diaper caddy next to the diaper cream and wipes?! Oh but we did. We had to. The teacher wrote back that onsies or overalls might slow him down… but I had to tell her that we’d already tried both of those. He was able to take the diaper off from underneath these types of clothing, leaving the clothing in tact so you didn’t know he wasn’t wearing his diaper until he’d peed his pants. Thus, the duct tape solution. The stripping behavior has stayed with us for many years. I recall once when Adrian was 6 and still wearing diapers that he took the diaper off and shredded it. Ever wonder what the insides of those diapers look like? I, unfortunately, can tell you. I walked into his room and there was yellow ‘snow’ everywhere. We finally got him toilet trained shortly after that incident.